Clockwise from top left: female golden stag beetle (Lamprima aurata（英语：Lamprima aurata）), rhinoceros beetle (Megasoma sp. 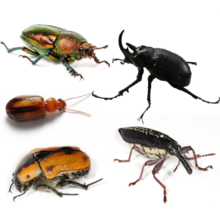 ), long nose weevil (Rhinotia hemistictus（英语：Rhinotia hemistictus）), cowboy beetle (Chondropyga dorsalis（英语：Chondropyga dorsalis）), and a species of Amblytelus（英语：Amblytelus）. J.F. Lawrence and A.F. Newton, Jr. 1995. Families and subfamilies of Coleoptera (with selected genera, notes, references and data on family-group names). pp. 779-1006 In: J. Pakaluk and S.A. Slipinski (eds. ): Biology, Phylogeny, and Classification of Coleoptera: Papers Celebrating the 80th Birthday of Roy A. Crowson. Museum i Instytut Zoologii PAN, Warszawa. ^ Bouchard, P.; Bousquet, Y.; Davies, A.; Alonso-Zarazaga, M.; Lawrence, J.; Lyal, C.; Newton, A.; Reid, C.; Schmitt, M.; Ślipiński, A.; Smith, A. Family-group names in Coleoptera (Insecta). ZooKeys. 2011, 88 (88): 1–972. PMC 3088472. PMID 21594053. doi:10.3897/zookeys.88.807.